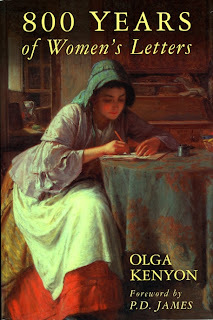 Aryamati, an Order Member from Manchester, is pleased to share the reprinting of one of her eight books on women’s writing. The book is titled '800 Years of Women’s Letters', and was first published 19 years ago, which - she says - means it can be classed a classic! She was among the first to research the rich source of information contained in women’s private letters, commenting "When not suspected of innovative ideas by their menfolk, they discussed a bold range of themes, from improving education and diplomacy to dealing with illness - and poverty". 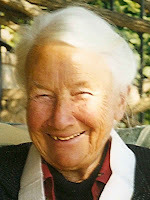 "I was particularly interested in women's spirituality, which is why l begin 800 years ago, with Hildegard of Bingen. Mystic, composer, herbalist, renowned preacher, she also wrote prescient advice to men in power. And Santa Teresa de Avila shows her ability as administrator, reformer and poet - spiritual women seldom mentioned by male hierarchy till recently. Though l include letters from Queens, l was also keen to find letters from working class women; easier once primary education was introduced. But l was pleased to find a petition from some women weavers at the time of the French revolution. l end with a letter l translated from La Pasionaria, the communist firebrand who made famous speeches to support the Republic against the uprising of Franco". Aryamati has been invited to speak for an hour on her book as part of International Women’s Week at Manchester Central Library. 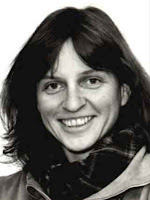 She'll be speaking on Wednesday 10 Mar from 6-7pm. The event is FREE and refreshments will be provided. Friends will read a range of lively extracts. You'll find more about the book, including some reviews, on Amazon. FWBO News is delighted to bring you news of the second FWBO International Retreat, a big family-friendly event run by the FWBO Chairs Assembly in conjunction with Buddhafield and Taraloka. There will be two sessions each day when those with children can bring their kids along to be looked after, allowing them to go to the talks, meditations and so on. Also, in the evening we'll have storytelling that kids can come to, sometimes join in, and sometimes stay for part of the ritual/puja that follows on from it... Children aged 3 or under can come for free, and 4 to 16 year olds half price. It promises to be another huge opportunity for a very imaginative collective celebration of Buddha Day (Wesak) - the festival of the Buddha's Enlightenment. It's also a great way to experience the depth and breadth of the movement, and to get a taste of just how satisfying it can be not just to practice but to live for a short time immersed in a Buddhist context, to work together in teams, and so on. 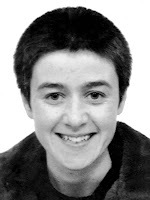 “During 2009 Vajraloka ran a successful appeal to raise £2000 for a complete overhaul of our shrineroom gear. I'd like to thanks all the many people who contributed so generously to help us reach this target. After many years of use, the old blankets, mats and cushions have now been boxed up and are looking for a new home! Though the gear looks well used, with bits of filling spilling out on the odd item , they could still be of use to a centre or outreach group, with some needle and thread. “Having supported people through thousands of hours of meditation, I’m sure they are well charged with prana and positivity! “In total we have 35 cushions, 23 mats, 9 foam blocks and 3 wooden stools. All we ask is that the recipient collects them, or meets the full cost of a courier. Remaining money from the appeal fund is going to support our ritual activities, in the form of some new devotional and musical items. 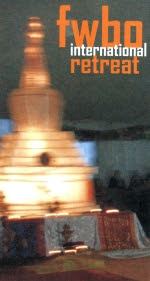 Details of their program of retreats are at vajraloka.org - or check their Facebook page. “Jaibhim and many good wishes from Bahujan Hitay project Amravati. “It is our pleasure to let you know that Bahujan Hitay project Amravati has organized the Bahujan Hitay annual festival. Participants included beneficiaries, indirect beneficiaries, stakeholder’s staff, donors, well-wishers and management. It is a reflection of our year long success, and for the first time we made it for four days in length, from 9-12 February. Events included sports events for the Staff and the cultural activities for our direct and indirect beneficiaries and stake holders. The concluding ceremony on 12 February was presided over by Dhammachari Nagabhadra, Chairman of our Bahujan Hitay project management committee. “India`s 60th Republic day was celebrated on 26th January 2010 all over India but there was something special about the festivities in Aundhe - a small village near Lonavala 100km from Mumbai. Unbelievably, it was first time Republic day had ever been celebrated in that community. “Aundhe is home to a community of Adivasi and Katakari people, known as nomadic tribes in India. They are every bit as marginalized, if not more so, than the Dalits, or Scheduled Castes, who TBMSG have been working with for over thirty years now. When we met them we were really surprised to discover that in last 60 years they were not knowing what is meant by republic day, nobody involve them in such occasions or make any efforts to aware them about their citizenship. So an early result of our work is that they celebrated 60th Republic Day for those people in their own community. 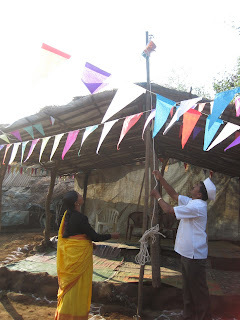 “On the day, the head of the local Sarpanch, or village Council, hosted the national flag in the early morning at 8.30 AM, saying that though Dr. Babasaheb Ambedkar had through his hard work given a constitution to the country, yet there is need to create an awareness amongst people about their rights and educate them how to receive basic amenities from the local authorities. “Alokashri then explained the purpose of the Bodhisattva Foundation and its first project, the Comprehensive Education Center was inaugurated. It will emphasise a balance of formal and non formal education, plus social awareness programs that will help raise the confidence of the community so that local people will take responsibility of their own development and become self reliant. “The Bodhisattva Foundation is an Indian Charitable Trust (NGO) run by Indian women who are actively involved in Buddhist practice and as expression of their practice working for underprivileged, marginalized and disadvantage section of the society. It works in partnership with Bodhisattva Activity, a similar trust registered in the UK”. “Visible Mantra is part of a bigger plan to create resources for Buddhists who use mantra as part of their practice. My aim is that Visible Mantra will also become a publishing house and will attract manuscripts from authors from a range of traditions on the subject of Buddhist mantra. I also regularly help individuals who want inscriptions transcribed and identified, or calligraphy of mantras (though I seldom do tattoos). “I hope to bring out the book of the website in 2010 - with high definition images of all the mantras on the site and a few more - and to eventually bring the website up to the same standard: e.g. to have all mantras and bījas in four scripts: Siddham, Devanāgarī, Tibetan (dbu-can) and Lantsa. “I also have planned a Siddhaṃ primer and have made a start on a history of mantra in Buddhism". “This year I'm asking each person who visits the site for a one off donation of 50p (about US$0.80) to the website. This would provide me with enough income to work on the Visible Mantra project full-time. “Over the years I've made a trickle of money from Amazon ads (about £50 a year). I'm still waiting to hit the threshold for a Google ads payout. But I've continued to put in as many hours as I could to create this resource and write my blog - sometimes to the detriment of my health”. Viryabodhi goes on to say - “Even if you don't understand Swedish you can enjoy the pictures and layout, and wonder at the reality that the FWBO flourishes in many countries and in languages that – well, what do you say? – are not easily understood, or sound like gobbledegook. “Issue no. 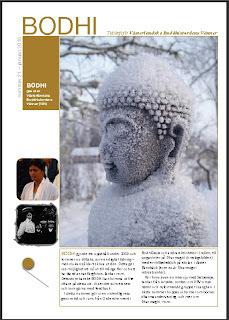 21 of BODHI contains the beautiful story (in translation) of Srivati's experience of her attendance of the Order Convention in Bodh Gaya, India, and the pilgrimage that followed, with the stunning photos of Padmadhara. It also takes a look into the distant past of Dharmagiri Retreat center, when it was a school – with a lovely photo from the early 1900's. One added bonus of being on-line is that we can have active hyperlinks to websites, e-mail addresses etc. “We hope to bring out BODHI a little more often, but it is certainly a test, so let us see. And we will send out a message that one can download it from our Swedish website. The photo you see is the cover, adapted from a template in Pages, an apple program. He says - “Let's roll! Wheelchairs are a go! “Fabulous news! The Sydney Buddhist Centre (SBC) has received funding to upgrade its building as part of the New South Wales Government's Community Building Partnership. The SBC was one of 13 local community organisations to receive funding and has been awarded $10,000. Winning the grant was the result of a group effort by Order Members, Mitras and friends who completed the application forms and encouraged others to vote for the SBC's application in an online poll. “So where do we go from here? Once the upgrade has been completed at the Sydney Buddhist Centre (SBC) we will begin to promote it as a wheelchair-accessible Buddhist centre. This means that all ongoing meditation courses and Sangha nights will be available to people in a wheelchair. 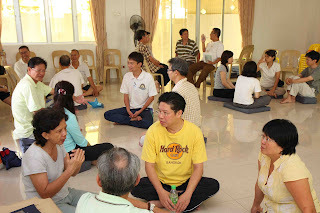 The SBC already caters for about 160 people who attend regular weekly classes, and about 300 people who undertake beginners meditation or Buddhism courses for the first time every year. We are very pleased that our centre will become more accessible to a broader population of people after these renovations. There will also be the option in the near future, if the need arises, for meditation courses for people experiencing chronic pain, illness or a disability. This is very positive news for the SBC. "Calling on Buddhists from all different traditions, this will be a journey to the magical area of Ladakh, in the Northwest of India, near the Tibetan border. Travelling through the beautiful scenery of Kashmir we will come to Ladakh, where Tibetan Buddhism is still preserved in a form that one cannot found anywhere else in the world. "The journey will lead through magical open landscape, clear air and to mountain lakes. There will be the possibilitiy to visit monasteries and to take part in people's everyday life. It is organised by Jayachitta who is reaching out to Buddhists from different schools to meet together, to share their experience and practice. "This trip will be an adventure in a breathtaking setting which we will be in the middle of, whether driving, trekking or meditating". For more detail please visit her website www.jayachitta.wordpress.com. Sugarbha writes from Windhorse: Evolution with news of their month-long Working Retreat. They’re making a video diary of the event - they plan to tell FWBO News readers and the wider Buddhist Sangha more about themselves and they see their work - and the business itself - as a really effective means of practicing Right Livelihood. “Windhorse: Evolution is a successful business, trading ethically in giftware. 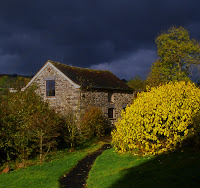 It’s the largest team based right livelihood business in the Triratna Buddhist Community/FWBO. “We employ approximately 250 people in total - about 100 people in Cambridge and a further 150 who work in the 18 Evolution shops around the UK and Ireland. “Right now we’re running a month-long working retreat in the warehouse. Here in part two of our video diary of the event, Satyaketu (our Warehouse Manager) outlines the scale of the operation and explains why we are now in a position to focus more on exploring work as a spiritual practice. 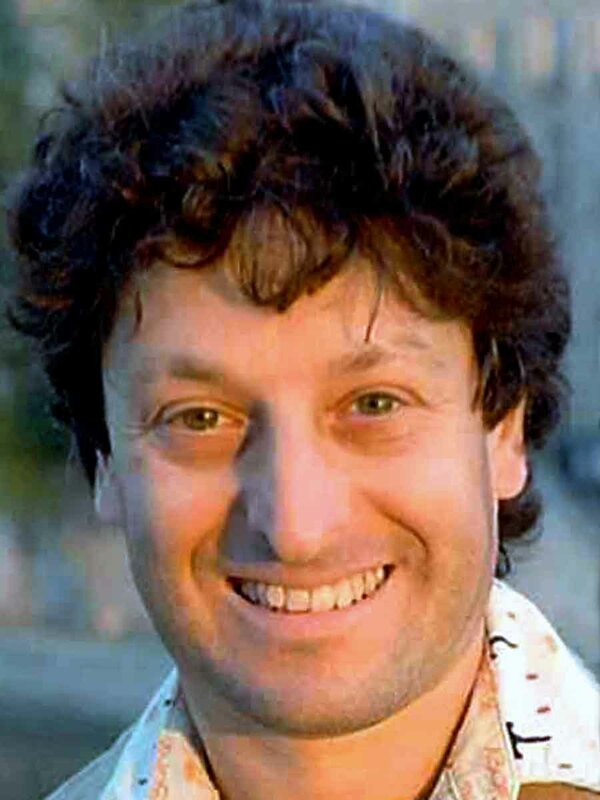 “The new charity shop for the London Buddhist Centre will be opened officially on Saturday 20th February at 2pm by Jnanavaca, the chairman of the London Buddhist Centre. There will be live music and a special window display of garments designed by Holly. We sell clothes and bric-a-brac and plan to have workshops for the local community teaching basic sewing skills and crafts. We have a mixture of affordable clothing and better quality garments at reasonable prices. “Holly who is designing garments and doing our window display for the opening has just finished filming a programme for BBC2 , part of the ” Mastercraft” series about traditional British crafts which will be shown in February. She has just finished designing the launch collection for a new shop in the Brick Lane area called "123, Bethnal Green Road" which will be opening later in February. She is interested in sustainability. Her garments are made with care and attention to detail and made to be worn over and over again, known as slow fashion, as opposed to much of the cheaper mass produced fast fashion today which is made to be briefly used and then replaced. “Please come and see us anytime we're open. Opening hours 12-6pm Monday-Friday and 10.30am-6pm Saturday. Please bring us donations of clothes and bric-a-brac during opening hours and help to keep the LBC providing Meditation and Buddhism teaching, MBCT courses, TBRL and communities which together create the "Buddhist village" of Bethnal Green. 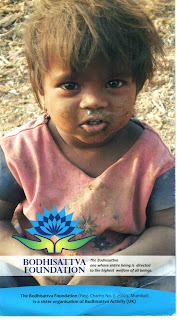 Karuna was formed in 1980 as Aid for India, the movement's response to the suffering of India's Dalit community. For 30 years, Karuna has worked with some of South Asia's most disadvantaged people, sending over £1 million every year to support low-caste and tribal communities, street children and refugees fulfill their potential through our social and Dharma projects. 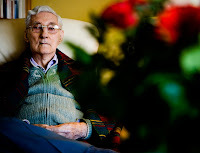 "In the late 1970's I was a young order member and had recently moved into a community near the London Buddhist Centre as I wanted to help the burgeoning movement and participate in right livelihood. The LBC had just opened and I was helping with some building work around the centre. One day, Subhuti (Chair of the LBC) invited me to go for a walk with him. He told me he was looking for someone who was able to take on the challenge of a big fundraising project; someone who would take responsibility for raising £50,000 for Dharma and social projects for the Indian Dalit community. This was an enormous amount of money in those days! Lokamitra, had been in India since 1978 teaching the Dharma to the Dalit community. In a short space of time he had realised that alongside the need for the Dharma, this community faced serious difficulties caused by caste discrimination, alongside, limited, if non-existent access to health care and education. In 1979, I visited India for the first time. One particular experience stuck me. I was trying to sleep one evening in the small hut where I was staying, when I became aware of a small dog being attacked by a pack of wild dogs on a patch of wasteland opposite the hut where I was staying. I lay there listening to the whining of the savaged animal, and said to my companions, "Can't we do anything?". In that moment, I realised what life was life for Dalits living in these conditions. That like the wild dogs roaming the wasteland, they were born into a life that was unsafe and lacking in compassion. At that time, the team in India were operating on a shoestring. For example, Dharma activities were conducted in a rudimentary garage (little more than a ramshackle tin hut), as well as corridors of flats with makeshift shrines. When I returned from my trip, I eagerly got to work by trying to translate my experiences of the projects and conditions I had witnessed into fundraising copy that would motivate people to give to the Dharma and social projects that were coming into being. I had no fundraising skills or experience and worked out of a small room in the community where I lived, typing with my gloves on with only a small paraffin heater for warmth! I also consulted 'Who's Who' looking for anyone with a connection or sympathy with India. In 6 months, my only response was from a couple in Hampstead. I eagerly went to the appointment and thought it had gone well. Afterwards, I was asked by Tim Lilley, my fundraising mentor, 'Did you close?' - I had forgotten to make the all important 'ask'. I was on a fast learning curve. Those first six months were tough but I was motivated by my experiences of the Dalit's conditions in India. I was eventually able to convince Tim to take on a role for a years salary and Karuna door-to-door appeals were born." Out of such humble beginnings, Karuna now supports hundreds of thousands of people across South Asia supporting projects that are building dignity, challenging discrimination and supporting people's practice of Buddhism. 80% of Karuna's work is supported by thousands of individuals across the UK who, having met with a Karuna fundraiser on a door-to-door appeal, has decided to make a regular contribution to the social and Dharma work in South Asia. 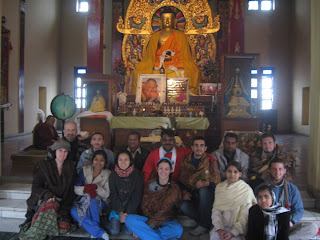 Today’s story on FWBO News comes from India’s National Network of Buddhist Youth (NNBY) - just back from participating in the 2010 International Buddhist Youth Exchange program, held in Malaysia. “Last week we have been in the Asean Youth Exchange at Malaysia. 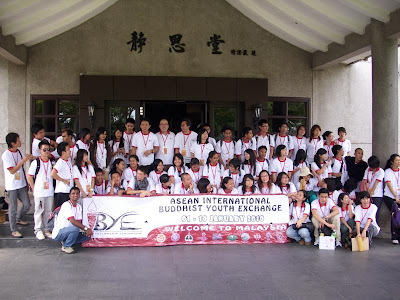 The WORLD FELLOWSHIP OF BUDDHIST YOUTH (WFBY) organized the ASEAN INTERNATIONAL BUDDHIST YOUTH EXCHANGE (IBYE) 2010 which was hosted by the YOUNG BUDDHIST ASSOCIATION OF MALAYSIA (YBAM). 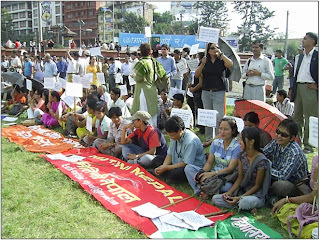 "We were representing the National Network of Buddhist Youth (NNBY) from India. Other countries which participated included Bangladesh, Indonesia, Nepal, Japan, Taiwan, Thailand, Malaysia, and South Korea. "The main object of the programme was to promote development of leadership qualities among Buddhist Youth and also to strengthen Buddhist Networking across South East Asia. The program was held in the Fo Guang Shan monastery. The theme of the event was “Joy, Fellowship and friendship. "International delegates were staying with Buddhist foster families for the first three days of the programme. Coinciding with the New Year and weekends, they had the opportunity to start 2010 in Malaysia, and also to feel and experience Malaysian lifestyle of living culture, food, sights and sound. "A series of sessions catering for the learning, contributing and tackling of current situations faced among youths in the Buddhist society, both local and international. 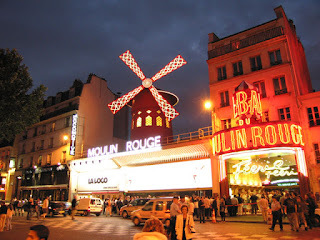 "The event created strong connections between those who attended. We hope these connections will contribute to the betterment of the youths in ASEAN and especially more widely in India. "For more information and picture follow ASEAN IBYE 2010 in facebook. Today and tomorrow we've two stories from Malaysia - independent visits by FWBO members from the UK and India, to different Buddhist groups. 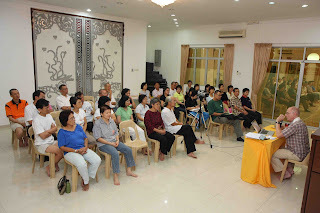 "I've just finished a series of talks followed by a practice weekend on karma for the Than Hsiang Foundation in Penang, Northern Malaysia. “As things turned out, I was the first person to teach at their newly established centre for English speaking Sangha members. Located in a very spacious ex-residential house in central Penang, the new place is at daytime used as a Buddhist kindergarten. “As in my experience has often been the case with an ethnically Chinese audience, in the first meeting it was difficult for me to assess what the group made of the input. Yet, with numbers of participants rising from day to day and there being increasingly lively discussions, I guess they found it interesting and fruitful. Furthermore, at the end of the practice weekend, even those who in the beginning had been rather solitary and perhaps somewhat distant, were happily engaged in our various group explorations and discussions. “It was a pleasure to see a sense of Sangha grow between all of us. Our explorations covered a vast ground - from the religiously Brahminical and Shramaneric background at the Buddha's time right down to the turning of karma into a commodity owing to the historical emphasis on karmic results, merit-making and to the notion of collective karma which are so prominent in Asian societies. Again and again, we came back to the Buddha's revolutionary insight into intention (cetana) as the essence of karma, and accordingly we explored both skilful and unskilful mental states and the path to move beyond karma in quite some detail. “Meanwhile, I've moved on to Melaka in the South of Malaysia where Samamati will be joining me shortly. Another series of 5 talks with a weekend preceding them lies ahead of us. Already, more than thirty people have booked ... which seems a pretty sure sign that more are likely to participate. Great to be here --- and away from the European winter!" Insight Young Voices is an on-line Dalit Youth Magazine currently featuring an interview with Subhuti, a long-standing member of the Western Buddhist Order and leading light in TBMSG’s Dhamma work in India. Anoop Kumar, the interviewer, explores with Subhuti the specific difficulties - and opportunities - faced by Buddhism in the world today - in fact in the ‘three worlds’ of the old Buddhist world, the new Buddhist world of the West, and the revived Buddhist world of India. Buddhism being reduced just to a new caste is indeed a great danger and we clearly witness this happening around us. How do we overcome this? Subhuti: "We must overcome this danger of the marginalisation of Buddhism, referring back to Dr Ambedkar’s thoughts on conversion: Why did he choose Buddha Dhamma? According to him, liberty, equality and fraternity can only be attained when there is a completely different set of ethical attitudes in Indian society. In a caste-based society one does not see another person in terms of duties towards him or her as a human being, but as a member of a particular caste that stands in a particular relation to one’s own caste. Babasaheb says that this is not really ethics at all. Dr Ambedkar’s great insight was that society has to be based on some genuine ethical principles, not the pseudo-ethics of caste duty". Buddhism is one of the world’s major religious traditions and therefore building linkages with wider Buddhist world was one of the main concerns of Babasaheb Ambedkar. As a practising Buddhist who is deeply involved with Buddhism as defined by Babasaheb, what are your observations on the wider Buddhist world? Subhuti: "Buddhism generally covers three worlds today: the old Buddhist world, the new Buddhist world of the West, and the revived Buddhist world of India. "The old Buddhist world of the East is not in good shape. 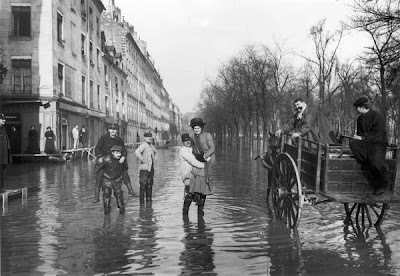 There are signs of revival here and there, but it is severely battered by modernity and is often not impressive today as an example of a living faith, related to the modern situation. There are impressive people and impressive movements, but Buddhism overall is not that impressive in its old heartlands. The example before us at present is, of course, Sri Lankan Buddhism, a significant and leading proportion of whose followers are, frankly speaking, racists and have used Buddhism as a weapon of cultural dominance. "Then, you have got the new Buddhist world of the West that has emerged from what has been called the ‘Me generation’, which I myself in fact came from – spoilt children of the post-colonial west who have lived with silver spoons in their mouths and face quite different sets of problems from their brothers and sisters elsewhere in the world, problems more of personal meaning and happiness. There is a strong tendency to individualism among western Buddhists and the Dhamma is often interpreted in quite narrow personal terms. "Then you have got Buddhist India, which I think is a very interesting intersection of the other two. For me, India is the key to the revival of Buddhism worldwide, because here the Buddhist movement is uncompromisingly modern and has a social conscience, as well. "This happened because Babasaheb, at least from one side, was the child of the European enlightenment, with its critical intellectual tradition, and at the same time he was also the child of the best of Indian culture: of the whole non-brahmanical shramanic traditions, of the Sant traditions represented by such as Kabir and so on, and above all of the Buddha. "So the movement initiated by him has the intellectually critical approach - if you like, the scientific approach - that is a principal feature of the modern world. Indian Buddhism is modern in this sense; on the other hand it is functioning in a traditional society with intact family structures, which we have lost to a considerable extent in much of the west, and it has a very strong commitment to social transformation. "In some ways, our Western Buddhist world shares more in common with India than the old Buddhist world of the East, because in our case we also started from a critical perspective. We in the west feel ourselves very much Buddhist, very much part of the Buddhist tradition, but we are not going to accept all aspects of it uncritically, and that is the position you take in India, following Babasaheb. "However, although there are similarities between Indian Buddhism today and western Buddhism, there are also discontinuities and some of these we should be careful to maintain. I don’t want to see western individualistic attitudes imported into India – although that is already happening, of course".